What do we mean by Preparing for Adulthood? All young people and their families face big changes when a young person leaves school, and needs to make plans for their future. 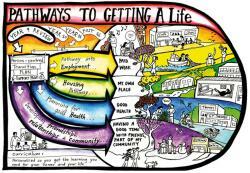 National guidance suggests that what young people want most is to 'get a life' and be part of their local community. This is the same for young people with SEND. 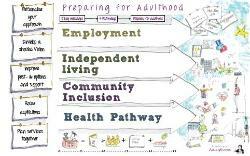 Preparing for Adulthood through good transition planning is particularly critical for young people with SEND so that they move smoothly from childhood into adulthood. Transition focuses on young people aged 14 to 25: the pivotal age at which they start to work out what they want to do with their lives. But raising aspirations for people with SEND and planning services to help them reach their goals needs to start in a child’s early years, or as soon as their additional needs come to light…. this requires a shift in thinking, particularly for those working with younger children. Local authorities must ensure that the EHC plan review at Year 9, and every review thereafter, includes a focus on preparing for adulthood. It can be helpful for EHC plan reviews before Year 9 to have this focus too. Planning must be centred around the individual and explore the child or young person’s aspirations and abilities, what they want to be able to do when they leave post-16 education or training and the support they need to achieve their ambition. Transition means change. We use this word when we talk about the journey from school to adulthood, and how we plan with you the change to your services. We must draw up a plan for every young person with an Education, Health and Care Plan. If you receive services from the Children’s Disability Team, these workers will be involved in your transfer to adult services. Transition planning starts when we look at the young person’s Education, Health and Care Plan with them at their Annual Review in Year 9, and every Annual Review from Year 9 onwards will include a focus on planning for adulthood. This means that as well as looking at educational progress, the review will also look at things like health, personal and social development, employment plans, how the young person gets around Islington, housing and leisure. For those with complex needs who need help from a lot of services, it is a good time to have all those people come together at the Year 9 Review, with the young person and parents. This will include a Social Worker from Adult Services Transition Team (if the young person is likely to need ongoing Care Services as an adult) or a SEND Keyworker, who can give advice on local pathways (e.g. internships, jobs, Further Education). After the Year 9 Review a Transition Plan should be drawn up, and this will then be reviewed every year. The school will normally be responsible for making sure that everyone does what they were asked to do in the plan. By the Year 10 review, the young person will have received careers advice to discuss post-16 options to make sure any applications are made on time. Planning move from school to adulthood. SEND Keyworkers will liaise with local colleges and support a young person’s application to move into local Further Education provision. Funding for a specialist college will only be considered by the LA if it is agreed that needs cannot be met locally. What happens between 18 up to 25 years? From Year 11, the LA will continue review a young persons Education, Health and Care Plan every year to make sure that it is still meeting the their needs, and will only cease a plan if it is no longer necessary e.g. special educational provision is no longer needed, as the educational outcomes set out in the plan have been achieved. When the young person is close to finishing their education, the LA will use the final annual review to agree the support needed to help them engage with services after they leave education. The Transition Social Worker / SEND Keyworker will continue to work with the young person until they leave full-time education. Following a young person’s 18th birthday, their legal status moves from being a child to being an adult. Once a young person reaches 18, their social care needs will be considered under the Care Act 2014, and charges will be made for some services provided. LAs must carry out a Transition Assessment if the young person is likely to have care and support needs after turning 18. This assessment will help design the right care and support plan and help the young person and their family to know what to expect when they become an adult. Those working with young people during transition should be aware that the eligibility criteria for Children’s and Adults’ services are different. This may result in some of the young person’s care and support needs not being eligible for services when they become an adult. Children’s Services may therefore have to help the young person and their family to think about different ways they might meet those ‘not eligible’ needs through existing networks or voluntary and community organisations. If a young person has ongoing health needs, their health team will support them to plan for their future. This could include a GP, Paediatrician, Occupational Therapist, Speech and Language Therapist, Physiotherapist and Nurses.